I don’t like international bureaucracies that push statist policies. In a perverse way, though, I admire their brassiness. They’re now arguing that higher taxes are good for growth. This isn’t a joke. They never offer any evidence, of course, but it’s now routine to find international bureaucrats asserting that there will be more prosperity if more resources are taken out of the private sector and given to politicians (see the 3:30 mark of this video for some evidence). Christine Lagarde, the lavishly paid head of the IMF, is doubling down on this bizarre idea that higher tax burdens are a way to generate more growth for poor nations. …we are here to discuss an equally powerful tool for global growth — domestic resource mobilization. …taxes, and the improvement of tax systems, can boost development in incredible ways… So today, allow me first to explain the IMF’s commitment to capacity development and second, to outline strategies governments can use to generate stable sources of revenue…the IMF has a third important development mission — capacity development. Keep in mind that all of the buzz phrases in the preceding passages – “resource mobilization” and “capacity development” – refer to governments imposing and collecting more taxes. …the focus of our event today — enabling countries to raise public tax revenues efficiently. And there’s plenty of rhetoric about how higher taxes somehow translate into more prosperity. Resource mobilization can, if pursued wisely, become a key pillar of strong economy… For many developing countries, increased revenue is a necessary catalyst to reach the 2030 Sustainable Development Goals, and can be a driver of inclusive growth. Yet in some countries revenue remains stagnant, as the resources needed to enhance economic and civic life sit on the sidelines. Lagarde’s entire speech was a triumph of anti-empiricism. For instance, the western world went from poverty to prosperity in the 1800s when government was very small, averaging less than 10 percent of economic output. Yet Lagarde makes an unsubstantiated assertion that today’s poor nations should have tax burdens of at least 15 percent of GDP (the OECD is even worse, arguing that taxes should consume 25 percent of economic output). How significant is the resource problem? Developing countries typically collect between 10 to 20 percent of GDP in taxes, while the average for advanced economies is closer to 40 percent. IMF staff research shows that developing countries should aim to collect 15 percent of GDP to improve the likelihood of achieving stable and sustainable growth. 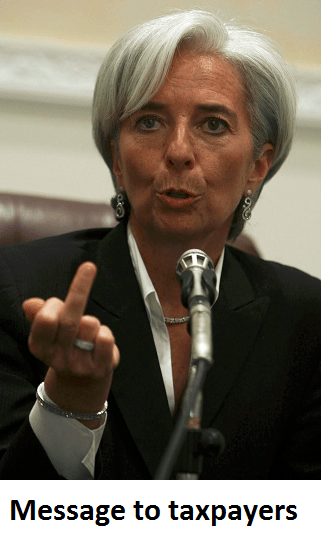 By the way, I should not that the IMF partnered with Oxfam, the radical left-wing pressure group, at the conference where her speech was delivered (sort of like the OECD cooperating with the crazies in the Occupy movement). Moreover, her support for higher taxes is rather hypocritical since she doesn’t have to pay tax on her munificent salary. I’ve also written about the various ways the IMF has endorsed higher taxes in the United States. It’s also worth noting that the IMF boss thinks America should have a bigger welfare state as well. Here’s some of what she said about policy in the United States. Policies need to help lower income households – including through a higher federal minimum wage, more generous earned income tax credit, and upgraded social programs for the nonworking poor. …There is a need to deepen and improve the provision of reasonable benefits to households… This should include paid family leave to care for a child or a parent, childcare assistance, and a better disability insurance program. I would just note that the U.S. is the only country among advanced economies without paid maternity leave at the national level. The IMF even figured out a way to criticize the notion of lower corporate taxation in the United States. Basically, the bureaucrats at the IMF want us to believe that money left in private hands will be poorly used. That’s a strange theory, but the oddest part of this report is that the IMF actually argued that a small repatriation holiday in 2004 somehow caused the recession of 2008 (almost all rational people put the blame on the Federal Reserve and the duo of Fannie Mae and Freddie Mac). The report noted that past major tax changes typically were followed by increases in financial risk-taking, including the tax reforms in 1986 and a corporate tax repatriation “holiday” in 2004. In both cases, these led to leverage buildups that were followed by recessions, in 1990 and 2008. …inflation and interest rates could rise more sharply than expected. This could increase market volatility and raise debt service costs for already-stretched corporate balance sheets, the IMF said. …”Tighter financial conditions could lead to distress” for weaker firms, the IMF said, noting that resulting losses would be borne by banks, life insurers, mutual funds, pension funds, and overseas institutions. But the U.S. isn’t special. 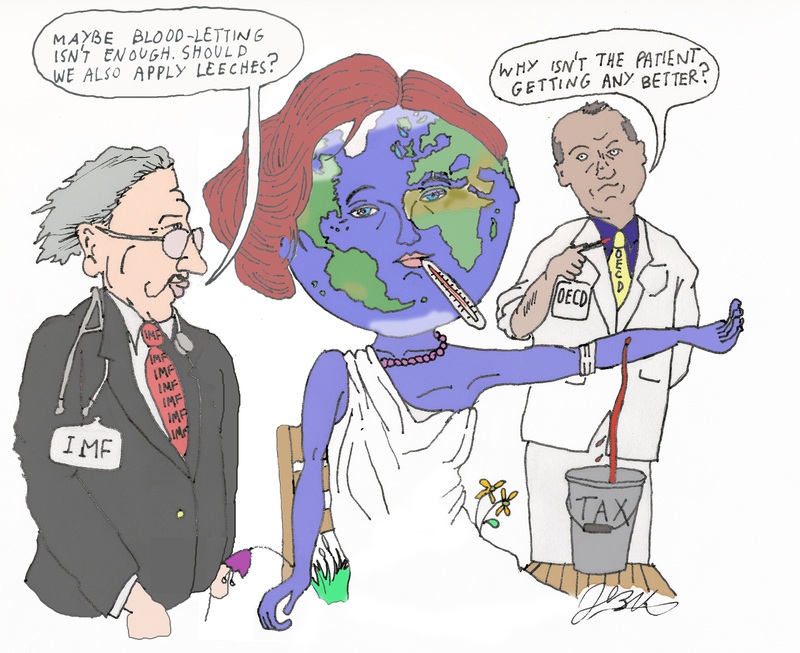 The IMF wants higher tax burdens everywhere. Such as the Caribbean. Over the past decade, governments in the Caribbean region have introduced the value-added tax (VAT) to modernize their tax system, rapidly mobilize revenue… VAT…has boosted revenues, the VAT has not reached its potential. …The paper also finds that although tax administration reforms can boost revenues, countries have just started… These reforms need to intensify in order to have a more significant impact on compliance and revenue. Writing for the Weekly Standard, Irwin Stelzer has a very dim assessment of the International Monetary Fund’s actions. He starts with some background information. The original vision of the IMF was as an agency attending to global stability… Along with the World Bank, the agency was created at an alcohol-fueled conference of 730 delegates from 44 nations, convened 72 years ago in Bretton Woods, New Hampshire. No matter that the delegates from one of the important attendees, the Soviet Union, did not speak English: Harry Dexter White, the head of the U.S. delegation, was a Soviet agent who kept Moscow informed of the goings-on. …Today’s IMF includes 189 nations, has some 2,700 employees and an annual budget in excess of $1 billion, almost 18 percent of which comes from U.S. taxpayers. He then points out that the IMF has a bad habit of putting dodgy people in charge. In 2004 Rodrigo Rato took the top chair and served until 2007, when he resigned to face trial in Spain for a variety of frauds involving over 70 bank accounts, and the amassing of a €27 million fortune in a web of dozens of companies. Sr. Rato was succeeded by Dominique Strauss-Kahn… Strauss-Kahn did a reasonable job until arrested in New York City on charges of imposing himself on a hotel maid whose testimony proved so incredible that all criminal charges were dropped. But DSK did settle her civil suit for a reported $1.5 million… Madame Christine Lagarde, former French finance minister, took over as managing director. …Lagarde now faces a criminal trial in France for approving a 2008 arbitration decision award of £340 million to a major financial supporter of then-president Nicolas Sarkozy that was later reversed by an appeals court. And he notes that these head bureaucrats are lavishly compensated. …her job…pays $500,000 per year, tax free, plus benefits and a $75,000 allowance to be paid “without any certification or justification by you, to enable you to maintain, in the interests of the Fund, a scale of living appropriate to your position as Managing Director.” The salary is twice the take-home pay of the American president, who must pay taxes on his $400,000 salary… Vacations and sick leave follow generous European standards. Last but not least, he points out that IMF economists have a lousy track record. All of which might be money well spent if the IMF had been reasonably successful in one of its key functions—forecasting the outlook for the international economy. …one can’t help wondering what is going on in the IMF’s highly paid forecasting shop. A study of the 189 IMF members by the Economist finds 220 instances between 1999 and 2014 in which an economy grew one year before sinking the next. “In its April forecasts the IMF never once foresaw the contraction looming in the next year.” The magazine’s random-number generator got it right 18 percent of the time. If all the IMF did was waste a lot of money producing inaccurate forecasts, I wouldn’t be overly upset. After all, economists seemingly specialize in getting the future wrong. My problem is that the IMF pushes bad policy. Let’s close with a defense of the bureaucracy. Desmond Lachman of the American Enterprise Institute argues that the IMF is needed because of future crises. A number of recent senior U.S. Treasury nominations, who are known for their antipathy towards the International Monetary Fund, seems to signal that President Trump might want to have a smaller IMF. Before he yields to the temptation of trying to downsize that institution, he might want to reflect on the fact that there is a high probability that during his term he will be confronted with a global economic crisis that will require a large IMF… It is generally not a good idea to think about downsizing the fire brigade on the eve of a major conflagration. In the same way, it would seem that President Trump would be ill-advised to think about reigning in the IMF at a time when there is the real prospect of a global economic crisis during his term of office. I actually agree with much of what Desmond wrote about the possibility of economic and fiscal crisis in the near future. The problem, though, is that the IMF is not a fire brigade. It’s more akin to a collection of fiscal pyromaniacs. P.S. In the interest of fairness, I want to acknowledge that we sometimes get good analysis from the IMF. Economists from that bureaucracy have concluded (two times!) that spending caps are the most effective fiscal rule. They also made some good observations about tax policy earlier this year. And IMF researchers in 2016 concluded that smaller government and lower taxes produce more prosperity. Moreover, an IMF study in 2015 found that decentralized government works better. P.P.S. On the other hand, I was greatly amused in 2014 when the IMF took two diametrically opposed positions on infrastructure spending in a three-month period. And I also think it’s funny that IMF bureaucrats inadvertently generated some very powerful evidence against the VAT. This argument–the IMF as some sort of backstop for fiscal/economic irresponsibility– merely induces moral hazard, i.e. it creates the environment for irresponsibility it is intended to prevent. Dumb.